Anyway, it was a little rough around the edges....and GREEN. I thought we had escaped the awfulness of '90's hunter green when we moved from our last house, but alas, here it was again. All the more motivation for me to paint, I guess. 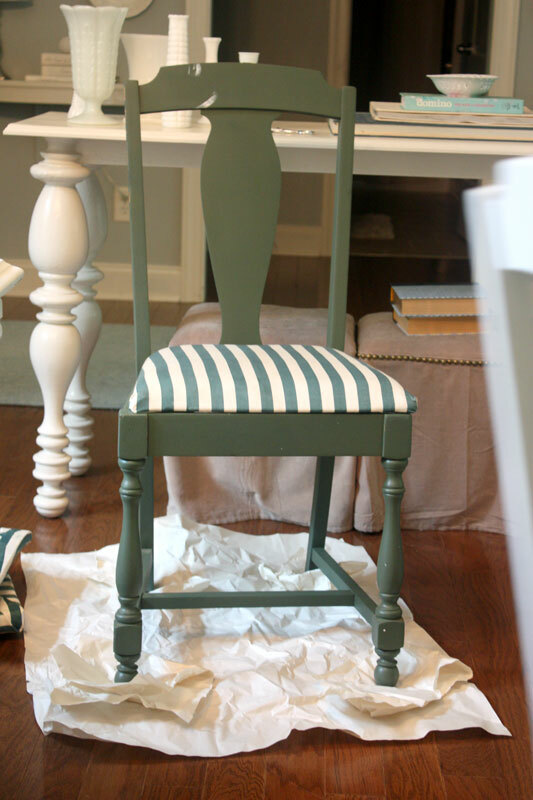 The fabric is Premier Prints "Barber" in Powder Blue. Looks like $85 very well spent! This turned out AMAZINGLY WELL!!!! Go you!! That table has such a great shape!! Oh, it's beautiful! I can see the contrast between the colors really well in the photos. I love that you used your wall colors. $85? You got a DEAL! It looks awesome! I think the contrast is just enough. What a great deal, and a great look! Another stunning transformation, Britt! I think the contrast between the chair and table colors is just right. I love it!! I found a very similar table at a yard sale a few weeks ago for $40 with 5 chairs. Needless to say, I grabbed it right up. I've been debating on what it would look like painted, and I open blogger this morning, and there it is! Thank you! I L.O.V.E. your dining room and am still in awe of your hand painted "wallpaper". I love the walls ... amazing color! Looks great! Love the "wallpaper" too. 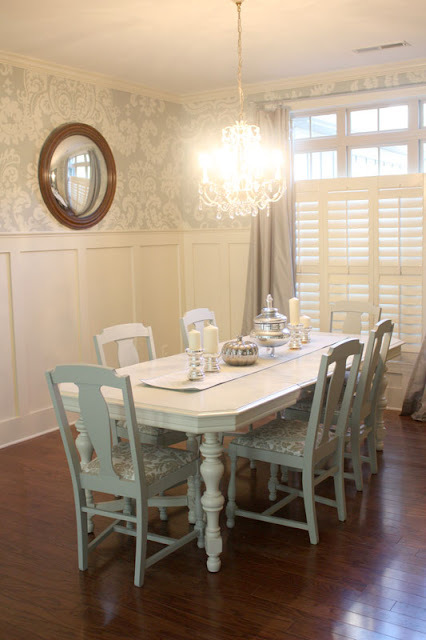 Maybe you need to paint the chairs a dark color to ground the space a bit - especially if you decide to get a light rug. Looks good anyway! Everything is lovely. You certainly inspire me. I have a question about the covered table on the landing. Looks fabulous by the way. Does the cat eat under there and if so what about cat hair on the tablecloth? WOW! really lovely! 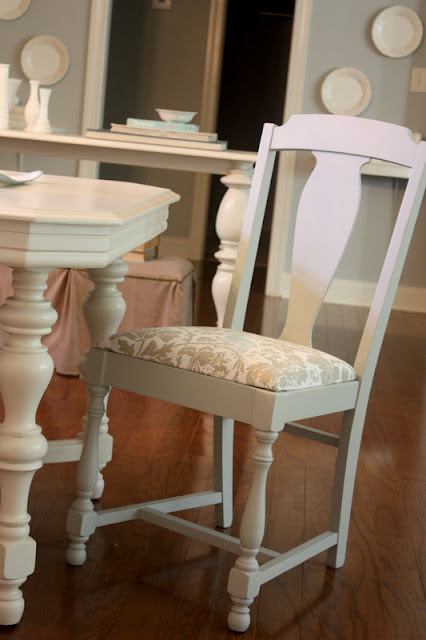 and i think the subtle contrast of the chairs and table is really, really nice. love it! Looks amazing! 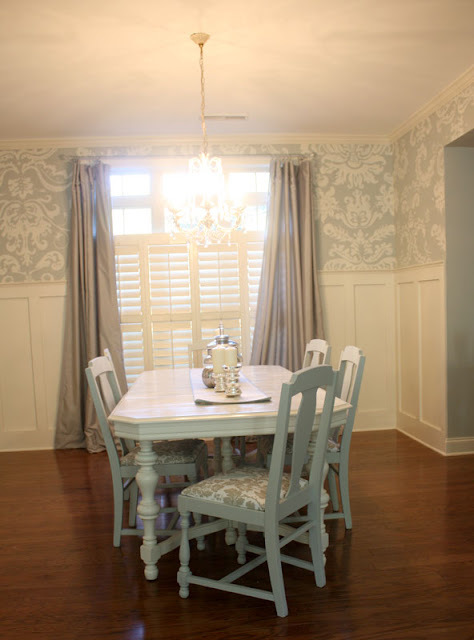 I love the wallpaper and chandelier. Beautiful! Your home is just lovely. I found your blog today and I definitely look forward to reading more. The entire room is GORGEOUS!!!! Great job Britt! Jocey, I don't really have a method per se. I just scuffed everything a little with fine grain sand paper and painted. No primer. I did add polycrylic on the top, though. Oh, and I used one of those small foam rollers for as much of it as I could to get a smooth finish. Hope that helps! 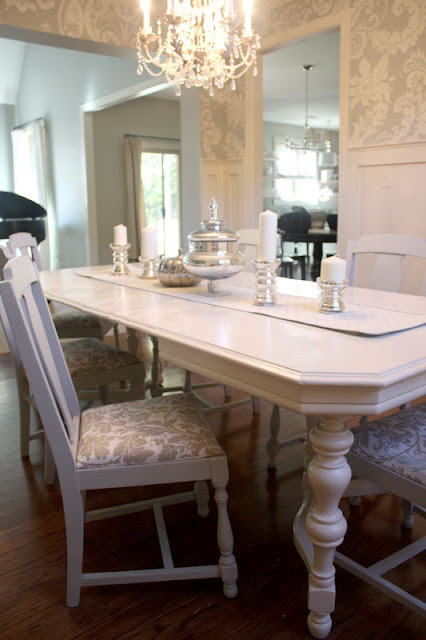 I love your blog and adore your dining room! What you've done is very inspiring. 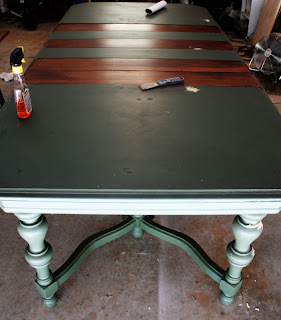 I have just got myself a bargain on ebay: a Queen Anne extendable table with 8 chairs - all for $66! Thanks to your blog I have now have some good ideas. Can't wait to see more of what you've got.